Although a parent may have very compelling reasons for not wanting to accept child support from her ex, Texas will not usually allow her to waive it. The state’s reasoning is that it’s not her money to decline. It belongs to her child. The state of Texas is aggressive when it comes to collecting child support. However, each case still comes down to the opinion of a single judge on a case-by-case basis. If a parent's child support case is assigned to a judge who is willing to work with her, she may have some options. Texas’s child support guidelines require a non-custodial parent to devote a percentage of his net income to the support of his children. The percentage increases with the number of children he must help support. If he is supporting one child, his child support obligation equals 20 percent of his take home pay. If he is supporting two children, this increases to 25 percent. The custodial parent pays for her child’s support directly, through housing, food and meeting his other expenses. If a custodial parent’s income is significant and her own financial resources can meet all her child’s needs, she can petition the court to deviate from the state’s child support percentages. This probably won’t result in her ex not having to pay anything at all, but she may be able to reduce his obligation below the statutory percentage. Because Texas’s statutes define child support as a child’s right, if the custodial parent does not need the child support payments to meet the child's needs, she can accept the money and set it aside for the eventual benefit of the child. For example, he can use the money to pay college costs or purchase a car when he’s old enough to drive. 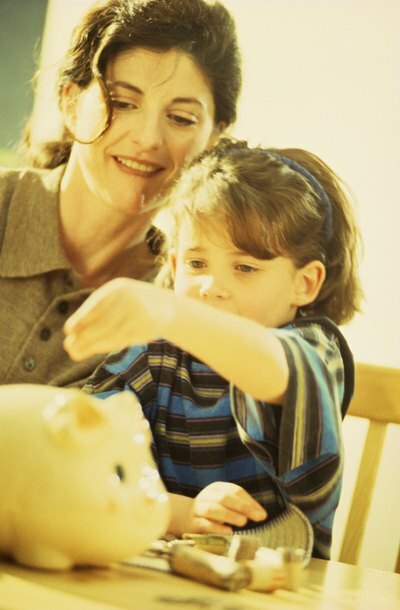 The parent receiving child support can place all payments into a custodial savings or investment account for the child. Such accounts turn the funds over to the child when he reaches the age of majority. A custodial parent does not necessarily have to collect on a child support order. Texas prefers that all child support payments go through its Child Support Disbursement Unit, so the CSDU can ensure that the non-custodial parent doesn’t fall behind. Judges usually include language to this effect in every support order they issue; the court automatically sends a copy of the order to the CSDU for enforcement. To avoid this, a custodial parent would have to ask the judge to omit this CSDU provision from her order at the time it is issued. If she later changes her mind and wants CSDU to enforce the order after all, she would have to petition the court to have her order changed so it obligates her ex to pay through the CSDU. If a support order is not registered with the CSDU, the state has no way of knowing whether she is actually receiving or accepting the court-ordered support, so it cannot begin collection efforts against her ex. When a couple has children, Texas will not let them divorce without addressing the issue of child support. However, in circumstances where parents were never married, the custodial parent can simply decline to file a SAPCR suit, which stands for “suit affecting the parent/child relationship.” A SAPCR suit initiates a child support order when unmarried parents separate. It is also part of every divorce action concerning kids in Texas. If parents are married and want to divorce, there is no avoiding it. However, if parents don't divorce, Texas has no way of forcing the custodial parent into initiating a SAPCR suit. Kalish Law Texas: What if You Don’t Want Child Support for Your Child? How Often Can You Check an Ex-Spouse's Income for Child Support in North Carolina? Child support is awarded to a custodial parent to assist with the expense of raising a child. The non-custodial parent is legally obligated to pay once a court has ordered it. Although the court makes a determination on the amount of child support at the time child support is awarded, the order can be modified at a later date due to a change in circumstances, such as when an ex-spouse’s income increases. Since January 1994, the United States government has mandated that all child support orders include provisions for payment through income withholding or wage garnishment. It’s a highly effective means of collection, but when the non-custodial parent is self-employed or chronically unemployed, wage garnishment can prove impossible. If you suspect your child’s other parent isn’t going to be honorable about voluntarily sending you child support checks, you can address this at the time the court issues your child support order. Tennessee law emphasizes each child's right to financial support from both parents regardless of the parents' relationship. However, the parents' custody rights often affect the process of obtaining child support. Each parent should know the relevant Tennessee laws regarding paternity, child support orders and enforcement of unpaid support. Parents who need help with asserting their rights may apply for services through the Child Support Services Division of the Tennessee Department of Human Services. What Is Child Support Technically Supposed to Be Used for in Texas? Can a Parent Relinquish Child Support?